Soc Trang (VNA) - A lack of a supply chain has caused problems for shrimp breeders in the Mekong Delta province of Soc Trang. Nguyen Van Bap, 45, Hoa Nho A village, Mekong Delta Soc Trang province’s My Xuyen district, owner of a 1-hectare shrimp pond, said he had to search for baby shrimp to buy and search for customers for his fully grown shrimp. Although Bap was involved in the village’s Agriculture and Fishery Co-operative for shrimp breeders for more than a decade hoping to join a supply chain, he only learned how to raise shrimps. Bap said he could earn about 300 million VND (13,400 USD) a year if he could find healthy baby shrimps and sell his shrimp at a good price. If not, he earned about 50 million VND (2,240 USD) a year. It’s tough to cover a family’s expenses with 50 million VND, he said. 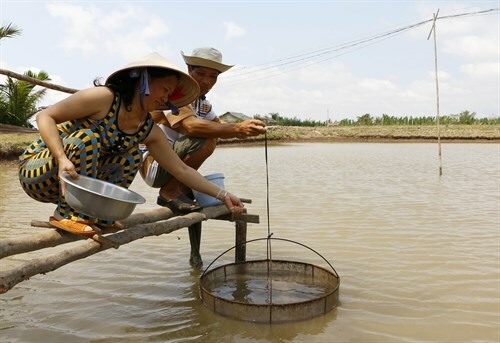 Trinh Thi Phuong, 41, said shrimp breeders like her needed support from co-operatives or an agency to connect with companies who will buy shrimp in stable prices and quantities. “It’s harder for shrimp breeders to find buyers and negotiate prices than if an agency helped us,” she added. Ngo Cong Luan, head of the co-operative, said it had 21 members with a total pond area for raising shrimps of more than 27 hectares. The yearly productivity of all members was five times higher after joining the co-operative, he said. “Productivity is now about 50 tonnes of shrimps per year,” he said. Luan said, the co-operative began to engage in the supply chain last year. The co-operative worked with several local breeding-food agents to ensure a stable source of breeding food for shrimp farmers, he said. However, the co-operative failed to connect with companies supplying healthy baby shrimps or companies to buy the fully-grown shrimps, he said. Companies selling baby shrimps often required breeders to buy in bulk and the breeders did not have enough money to do that, he said. The co-operative was small-scale, so it did not have enough money to pay in advance, he said. Tran Dinh Luan, director of the provincial Agriculture and Rural Development, said that breeders and authorised agencies knew a supply chain model was important to developing agriculture. In the livestock sector, supply chains bring many benefits, including ensuring food hygiene and safety standards, he said. In a supply chain, a breeder has to follow regulations on food hygiene and safety standards. This reduces risk for breeders and companies, he added. A decision issued by the Government in 2013 to approve agricultural restructuring by 2020, had boosted supply chains in the livestock sector, he said. However, applying supply chains in the province was difficult. Co-operatives lacked capital to assist breeders and could not borrow money from banks due to a lack of collateral, breeders also knew little about supply chains and did not know how to connect with companies, he said. To tackle the situation, the province planned to establish an additional 120 sub-cooperatives in 2016-17, and ask for financial and technical support from non-governmental organisations to bring breeders, co-operatives and companies together into a supply chain, he said. Soc Trang province now has more than 21,000 shrimp breeders, with 22 co-operatives and 170 sub-cooperatives. In a related movement, Oxfam is set to launch on May 25 a four-year project, worth 2.5 million EUR (2.8 million USD), named “Sustainable and equitable shrimp production and value chain development” in the Mekong Delta provinces of Soc Trang, Bac Lieu and Ca Mau.